February is fast approaching and the month of love will soon be upon us! This week our theme on the BoBunny blog is love. We will be sharing all kinds of loved themed projects, from banners to scrapbook pages and everything in between. 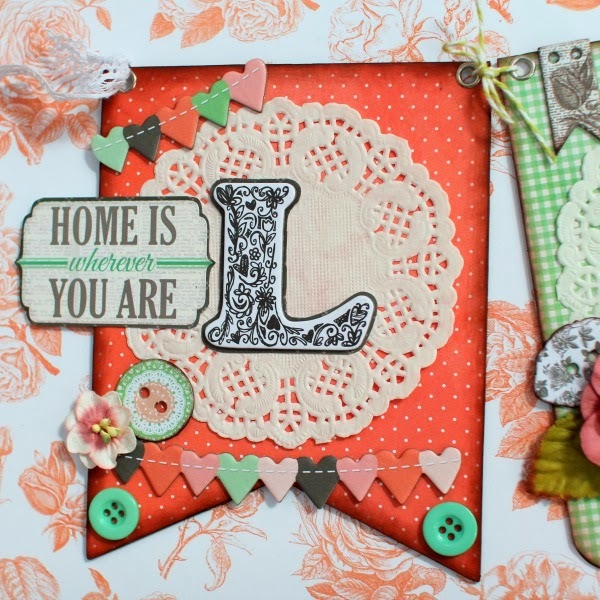 Today, Ilene and Lisa, have each created an adorable banner that would add the perfect touch of love to anyone's home! Our challenge was to create a love banner and I wanted to use the Pincushion line since it has such sweet, soft colors, and so many cute elements and "love" sentiments. The colors are so neutral and pleasant that they would go great with any home decor, and look good during any season - be it Valentine's day, Spring, or Summer! To make the actual banner, I used a naked Punky Sprouts mini and used my Crop-A-Dile to punch holes in the top and finished them off with large silver brads. I used the "LOVE" letters from the Head Over Heels 12x12 Chipboard. They were black and white, so they went well with the Pincushion collection. I backed them up with black paper from the Pincushion collection to help them stand out more against the white doilies. I also used a lot of BoBunny doilies. Don't they add such a soft, pretty effect? As usual, I layered a ton of different elements, and inked the edges well. 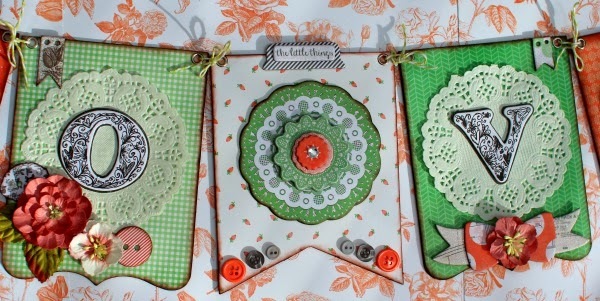 For the middle panel, I layered a doily chipboard piece from the 12 x 12 Pincushion Chipboard and a layered chipboard doily from the Pincushion Layered Chipboard to add more interest to the banner. It also gives the banner an uneven number of panels. Banners tend to be more visually appealing with an uneven number of panels. I also used a ton of buttons, including both chipboard and real ones from the Pincushion Buttons. Layered with chipboard banners and flowers, they work together to add a lot of dimension and variety without making it look overly crowded or busy. If you have never tried creating banners you are in for a real treat. 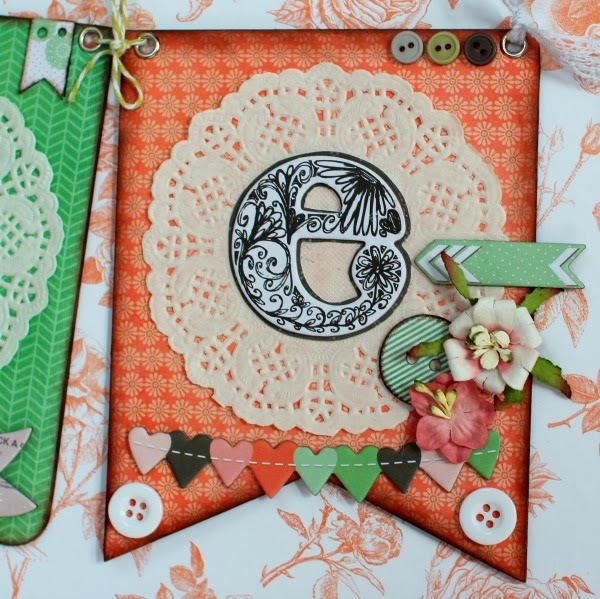 BoBunny's Head Over Heels collection is a perfect ensemble of coordinated pattern paper, chipboard, buttons and die cuts all just begging to be layered! 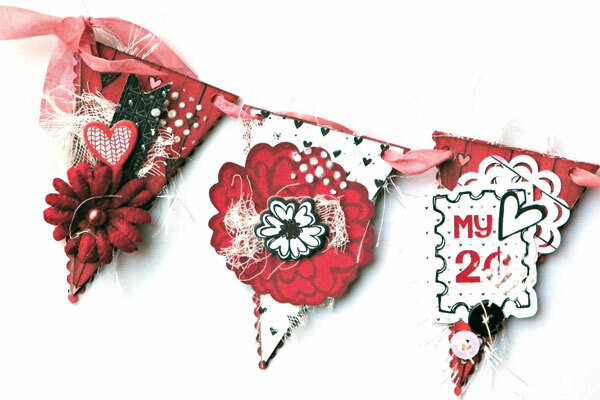 Not only are banners fun to create but they can be used in several ways. String them together and hang them or use rings and stack them for a mini album. 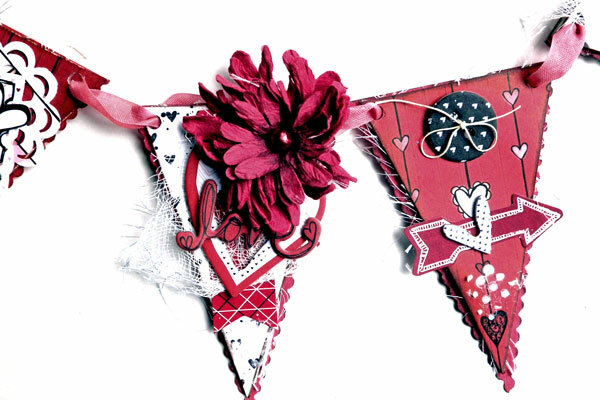 You can even decorate each one and use it as an embellishment in a mini album or card! Versatility at it's best! 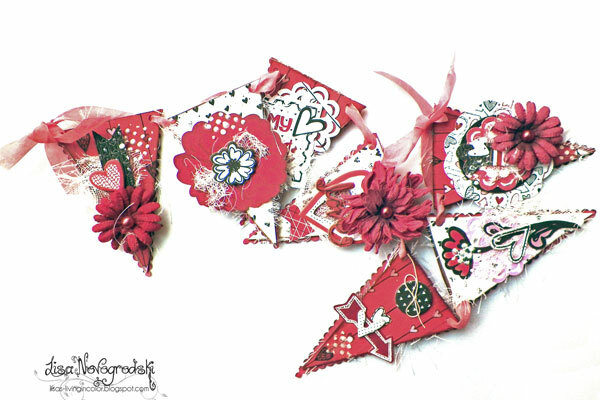 I started off with a chipboard banner shape, backed it in the Strawberry Double Dot cardstock and then layered the front with Head Over Heels pattern paper and embellishments. I love lots of little details and I really piled on the Noteworthy die cuts, 12 x 12 chipboard and a little added cheesecloth and eyelash yarn for shabby chicness. The Wildberry Daisy Blossoms coordinate perfectly with this collection. I added some modeling paste for additional interest, dyed some seam binding to match, punched holes in the chipboard and strung the banner pieces together. These banners are both truly amazing! Love them! 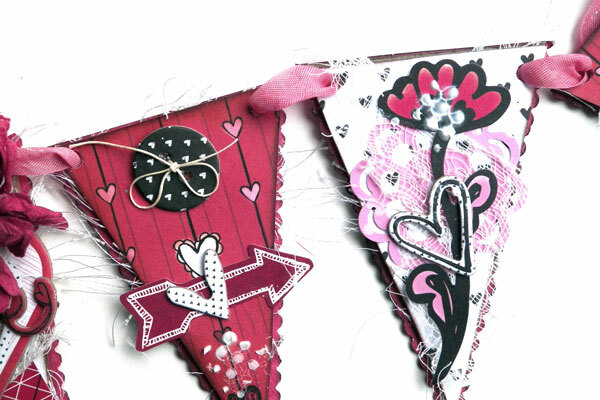 LOVE the colours and DELICIOUS layers in both of these DELIGHTFUL banners!! !